Gold prices continued to shine this week reaching $1,244.70 per ounce and and has posted gains in five of the last six weeks. This week it reached a new three-month high – it’s highest since the Trump win and has climbed over 6% this year, beating the gains made in the same period in 2016. The yellow metal has climbed 4.30% in the US dollar, 3.38% in the Euro and 1.35% in the sterling, in the last 30 days. This week gold is marginally higher in dollars and pounds but 1.5% higher in euro terms after the euro weakened on concerns of contagion due to the unresolved issues with Greece and other so called “PIIGS” nations and their still vulnerable banks and economies. This performance has surprised many commentators and analysts as gold’s three month high has come at a time when stock prices are also breaking records. Whether you are for or against Trump, there is no denying that the rule book of what elected politicians should and should not do has been wholly torn to pieces and thrown out the window. For starters, Trump appears to expect to be busy during his first 100 days putting in place exactly what he promised he would do, during his election campaign. This is almost unheard of. As Frank Holmes writes, the media took Trump literally but not seriously, his supporters took him seriously but not literally. The outcome of these expectations are showing themselves. We take a brief look at what has driven gold this week and ask what the end of Trump’s honeymoon means for the gold price. This week the gold price hit a three-month high and has surged over 7.5% so far this year. 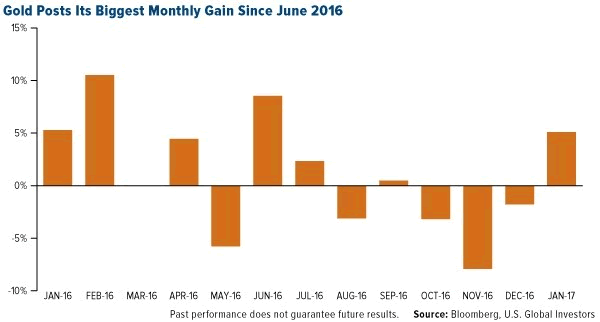 As we have shown in recent weeks, January saw gold post its biggest monthly gains since June 2016 (see table below) when surprise and uncertainty surrounding Brexit was driving the markets. It may come as a surprise to some, but we are not just seeing reactions to everything that comes out of Trump’s mouth, office and Twitter feed at the moment. (Soon people will begin to realise that not every tweet can be seen as some kind of constitutional crisis). Attentions are beginning to refocus on the implications of what Trump may or may not succeed in doing, the wider US economy and, of course, what is happening elsewhere. The gold price is being pushed upwards not only by the uncertainty surrounding Trump’s economic, foreign and domestic policies, a more dovish Fed, the growing populist movement in Europe, ongoing currency printing and debasement by central banks, growing inflation and the strength of the US dollar. 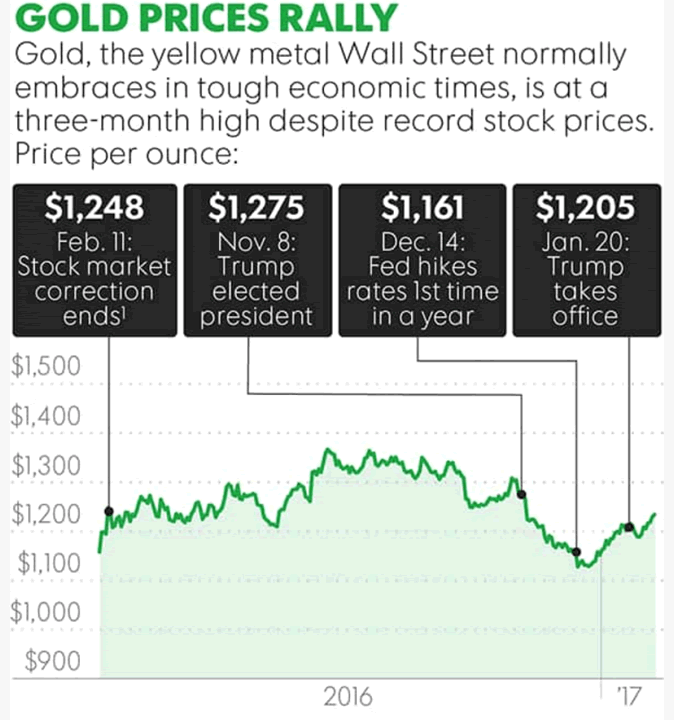 It is not just in Trump’s case that conventional rules no longer apply, they also appear to have been thrown out the window for precious metals in these first few weeks of 2017, namely that a strong US stock market means weak gold. 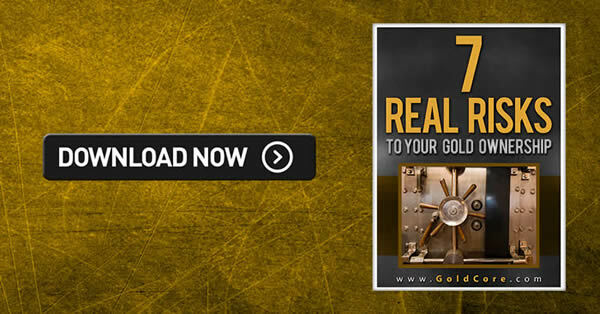 Instead apparently strong economies, a record breaking stock market and recent highs for gold all seem to be able to exist in one realm of reality. But this is a feat unlikely to last in the long-run, which only appears to be good for gold. 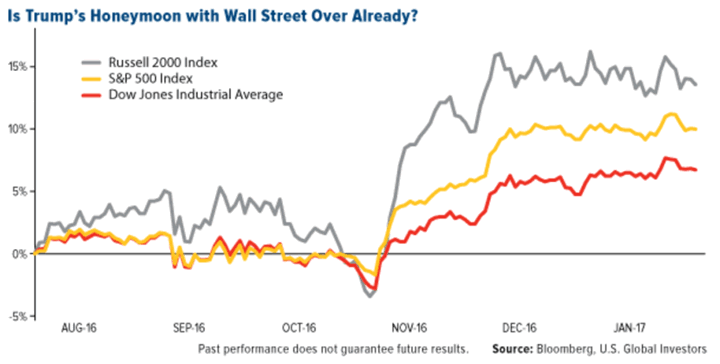 As Frank Holmes points out in a recent piece, the rally on Wall Street is beginning to slow-down and investors are turning to gold. Earlier this week we wrote about how you should really buy your loved one real gold this Valentine’s Day, by setting up a GoldSaver account, rather than waste money on the usual jewellery, chocolates and flowers. As Frank Holmes explains it seems gold is also what we should turn to when the love affair is over, which is exactly what institutional investors are doing as the rose-tinted glasses and honeymoon with Trump disappears. As we mentioned last week, the World Gold Council’s report for 2016 showed that gold demand climbed to it’s highest in four years, by 70%. Much of this was driven by ETF demand, which had their second-best year on record. Flows into gold ETFs have continued this year. Currently GLD holdings are 150 tonnes below their peak of 2016, but still at significant levels. The inflows into GLD are perhaps having some effect on the gold price. These significant inflows are likely coming from institutional buyers which are indication of perhaps further gains in the gold price. Institutional buying was no doubt influenced by leading hedge fund manager Stanley Druckenmiller who announced this week that he had bought gold in late December and January. Goldcore readers will remember that we wrote about Druckenmiller’s gold sales on the night of Trump’s victory. At the time he declared that he no longer saw the reasons to hold gold. Today however he does, in an interview earlier this week he stated, “I wanted to own some currency and no country wants its currency to strengthen. Gold was down a lot so I bought it.” Quite the about turn! According to Bloomberg, Druckenmiller also pointed to the uncertainty over whether or not Trump will back the House Republican’s tax plan, as a reason for his precious metal’s purchase. Even though Trump has signed an executive order that is designed to reduce red-tape, companies, executives and shareholders seem increasingly lukewarm in their responses to Trump’s changes. And whilst we may not all agree with Trump’s protectionism ideas and planned policies, Holmes argues that it is difficult not to see why US companies might feel like they need some level of protection. He refers to “China’s ascent as an economic and corporate juggernaut”. “Take a look at the chart below, using data from Fortune Magazine’s annual list of the world’s 500 largest companies by revenue. Whereas the U.S. has lost ground globally over the past 20 years, China’s share of large companies has exploded, from having only three on the list in 1995 to 103 in 2015. The number of Japanese firms, meanwhile, has more than halved in that time. But this, combined with how it is received across the various areas of US policy and lawmaking, is making predictions regarding the financial climate, so uncertain. The weakening in the US dollar, something Trump has been pushing for since the week of his inauguration, combines with a dovish Federal Reserve, expectations of higher inflation and growing demand for a safe haven, have each helped to support the gold price. The most imminent threat of uncertainty comes from Trump. His proposals are running into problems and the new President’s reactions each time he realises the meaning of checks and balances are not even worthy of a prediction. In turn, whilst Trump’s words to clearly have an impact, there is a wider world out there that is also trying to navigate financial crises, political changes and security issues. We have written before about ignoring the hype. Right now, it is difficult not to as one cannot disparage the thought that is the US-centric news that is supporting gold and will likely send it much higher. But, the wider-outlook is what makes gold a good investment for the long-run. Presidents come and go, but their impact takes time to unfold and in the meantime there are decisions, trades, wars and elections going on across the world that also feed into the long-term gold trade. Not too mention the looming milestone of a bankrupt America hitting the $20 trillion national debt mark in the coming weeks. 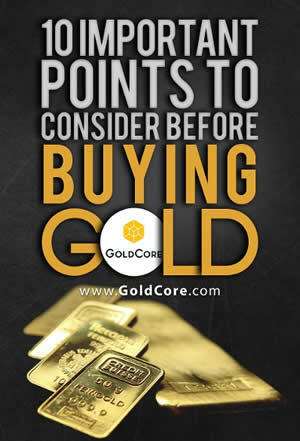 Gold as Druckenmiller alluded to, is a currency. But unlike sovereign currencies, it holds its value and does not rely on outside sources to maintain its value. We’re starting to sound like broken records here but we strongly believe that the uncertainty and unpredictability that exists across much of the geopolitical sphere, but is exacerbated by Trump, makes being long-gold right now, an entirely logical and prudent decision. Providing it is owned in non digital, website, technology dependent formats of actual gold coins and bars that you can sell to many providers and take delivery with a phone call or a visit.